Taste Budapest's Splendid Cocktail, Eger's Famous 'Bikaver' and the King ofWines, Tokaj's 'Aszú' ..............$835 (exclusive of airfare). Day 1: Arrival at Budapest, 'Paris of the East'. 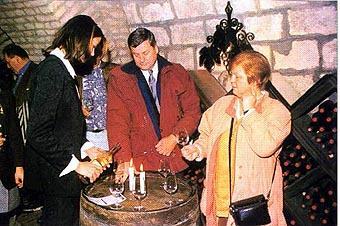 Greeting at the House of Hungarian Wines. Dinner at a restaurant in 'Old Buda' with Hungarian gypsy music. Day 2: Visit to a neighbouring wine cellar (Etyek or Budafok). Lunch sampling Hungarian culinary delights. Budapest - sight-seeing with an introduction 'to the wonders of hilly Buda and flat Pest'. Coffee or tea in a local cafe. Relax at the hotel. Bohemian dinner at the favourite restaurant of our most popular actors. Danube Legend - a boat trip introducing the illuminated treasures of Buda and Pest (a glass of champagne included). Day 3: Travel to the North-East, to charming Eger (120km), an educational centre and the seat of the bishop. Short surprise - greeting and refreshments at the foot of the heroic castle, Szilvásvárad (40km). Getting to know the traditions of the Lippizan horses in Hungary. Carriage ride across the village. A small train takes us to the National Park of the Bükk Mountains. Lunch is a trout barbecue with unforgettable wines near the beautiful 'veil' waterfall. Relax in Eger. To Noszvaj (15km) for a delicious dinner and visit to a famous wine expert's cellar. Night stop in Eger. Day 4: Farewell from Eger - organ concert. 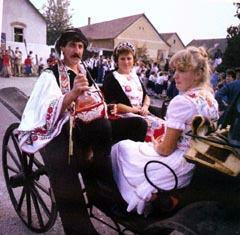 Travel to the 'Tokaj' wine-district , where the 'kings' wine' and the 'king of wines' is made - Tokaj's 'Aszú'. Visit to traditional and a modern wine-cellars. Lunch with delicacies. Travel to the Hortobágy area (120km). Special programme and night-stop in a comfortable 'horse' hotel in the middle of the legendary 'wild puszta'. Day 5: Hortobágy - revealing the secrets of the 'puszta'. Gödöllö - visit to the newly restored building of the royal castle, one of the most beloved residences of Queen Elisabeth (Sissy). Used as army barracks by the occupying Russian troops. Lunch including the favourite dishes of our Queen Sissy. Budapest - free time in the downtown area. Váci Street and the Danube promenade. 'Farewell to Budapest' dinner in the Castle district, featuring an introduction to the wines of the remaining wine-districts . Day 6: Travel to Szentendre (30km), a mediterranean-style artistic city along the banks of the Danube. Walk through town and museum visit, followed by free time in the world of ancient, narrow streets. Farewell lunch with a surprise prior to Departure. We hope to see you again real soon!